NORCROSS, Ga.—“Finding your place,” whether as an individual or a church, is a basic human longing, a necessary step toward fulfilling the calling of Christ, and the focus of The Mission Society’s latest issue of its magazine, “Unfinished.” Multiple articles in the Winter 2015 installment demonstrate how a clear understanding of purpose can help individuals and churches work more effectively and with greater joy in God’s kingdom. In recounting the stories of several individuals and churches, the publication displays the various dynamics that can affect a search for purpose. “Finding Your Place When Your Place Seems Unclear” is a first-person account about the “sometimes-hazy call” that would take a Midwestern (?) couple to South Asia. “Just Say Yes” is a story of a dentist who found her place in full-time missions ministry with her local church. The partnership that transformed the Central United church is part of The Mission Society’s coaching and mentoring programs offered to help churches find their unique mission. That approach is outlined in “The Kingdom Approach” by Stan Self, who explains how three simple questions can help struggling churches find their way in an ever-changing world. The Mission Society in this issue also describes its new mission service options that offer a variety of term lengths and service opportunities that may be especially attractive to millennials interested in missions experiences that are shorter and include mentoring, and to career professionals who are eager to use their training in cross-cultural ministry. In addition, this issue of “Unfinished” provides news on global mission efforts and offers information about helping Syrian refugees in Europe. Download the latest issue or subscribe to the publication for free at https://www.themissionsociety.org/unfinished-magazine. Founded in 1984 in the Wesleyan tradition, The Mission Society (www.themissionsociety.org) exists to mobilize and deploy the body of Christ globally to join Jesus in His mission, especially among the least-reached peoples. The Mission Society recruits, trains and sends Christian missionaries to minister around the world. Its church ministry department provides seminars, workshops and mentoring for congregations in the United States and abroad, helping equip churches for outreach in their communities and worldwide. The Mission Society has 180 missionaries serving in 35 countries. PHOTO CUTLINE: The latest issue of The Mission Society’s quarterly publication helps readers determine their calling as they encounter individuals and churches who traveled a variety of roads to the place God has called them to be. 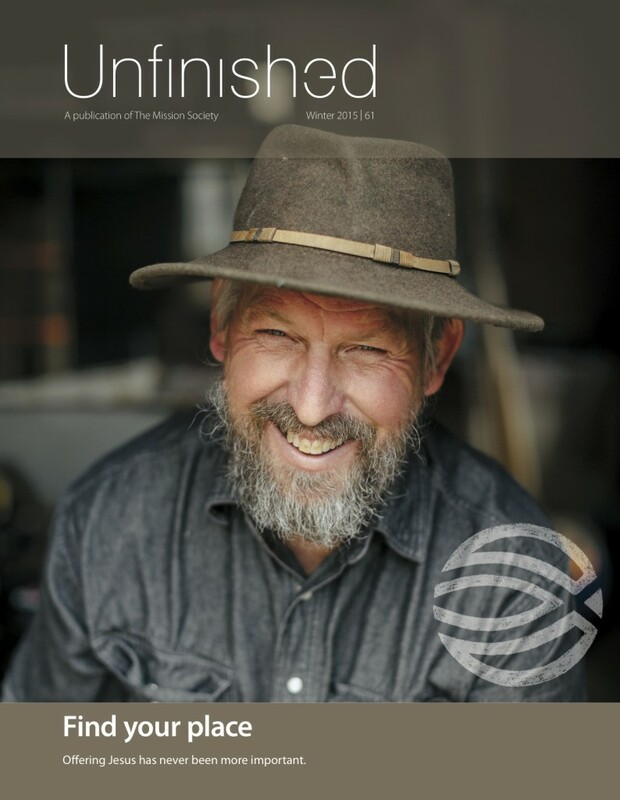 The Winter issue of “Unfinished” provides details of how The Mission Society’s programs and resources can help others find their own sweet spot of kingdom life. Multiple articles in the Winter 2015 installment of "Unfinished" demonstrate how a clear understanding of purpose can help individuals and churches work more effectively and with greater joy in God’s kingdom.